If you’re a fan of nature, water or gravity then keep reading to find out which waterfalls are worth a visit. The most famous waterfall and the one you probably thought of straight away is Niagara Falls, which borders Canada and the USA. This waterfall is actually made up of 3 different waterfalls. Although magnificent it can get quite crowded due to its popularity. Due to this it hasn’t made it on this list, so here are 7 other waterfalls you must see. First of all, take a trip to Croatia and visit the Plitvice Falls, which are located in the Plitvice Lakes National Park. 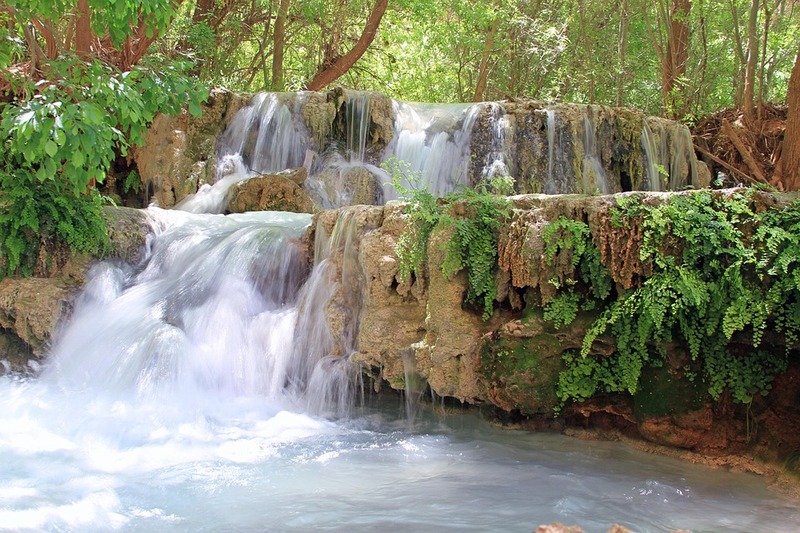 Here you will see multiple cascading waterfalls that are crystal clear with hints of turquoise and emerald green. What is great about these waterfalls is that they lead into water pools, some of which are warm. If you book a kayaking tour or take a walk through the National Park, it’s possible to jump right in and have a swim. So, take your swimsuit as well as a camera. Best time to visit is the summer, as it has predictably warm weather. The second waterfall worth mentioning is in Arizona, USA. Havasu Falls (100 feet tall) is part of the Havasupai waterfalls, which is located in the part of the Grand Canyon owned by the Havasupai Tribe. Visiting these wonderful combines a hiking trip with learning about the native tribe that has lived there since it was discovered. 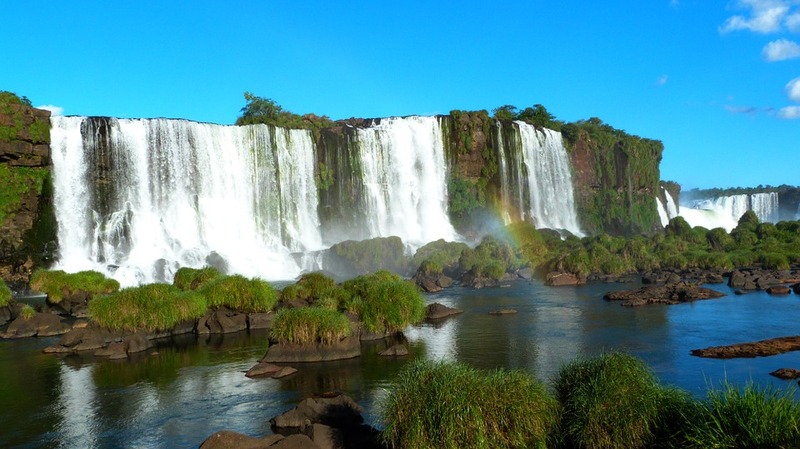 Standing at an inspiring 270 feet Iguazu Falls can be found between Brazil & Argentina. Our 3rd suggestion, The Iguazu falls, is made up of hundreds of jaw-dropping waterfalls, that span nearly 3km wide. They are situated in a national park, which is always open so the you can visit any time of year. But the best time to visit is March – October because this is when you are less likely to get caught out in the rain and also when the countries are at their coolest. Another not to be missed waterfall is in Venezuela. Considered to be the World’s tallest continuous waterfall at 3,212 feet is Angel Falls. While the Angel Falls are a magnificent site to see, check your governments travel advise for Venezuela before travelling. Some parts of the country can be dangerous. Perhaps the most dangerous waterfall to visit but also the most dramatically beautiful. To see our 5th suggestion simply watch a film, although seeing it with your own eyes is best. Have you seen Jurassic Park? The Manawaiopuna Falls featured in the 1993 film is in Hawaii on the island of Kauai. These privately owned waterfalls stand at 360 feet high. Combine your trip to Hawaii with a once in a lifetime helicopter ride. Avoid going during the rainy season which is November to March. Browne Falls in New Zealand are the 10th tallest waterfalls at 2,743 ft. If you’re travelling all the way to New Zealand you must include it in your itinerary – Doubtful Sound, South Island. There are two other waterfalls within the area called Helena Falls and Lady Alice Falls. Go and see them too! The final and probably the best in terms of access and spectacle is in South Africa. The Royal Natal National Park is the home of the second tallest waterfall, Tugela Falls. The national park offers various footpaths. Allow your mind, body and soul to absorb the wondrous and mountainous surroundings. To hike to the Tugela Falls you will need good hiking shoes and plenty of water. If you start the hike from the car park its 9km or 5.5 miles, depending on your preferred measurement. The hike isn’t for everyone because it includes rope ladders. This is when you need to have a head for heights. If you don’t you won’t make it to Sentinel Rock or the falls, which follow shortly after. It could be the most beautiful place on earth. 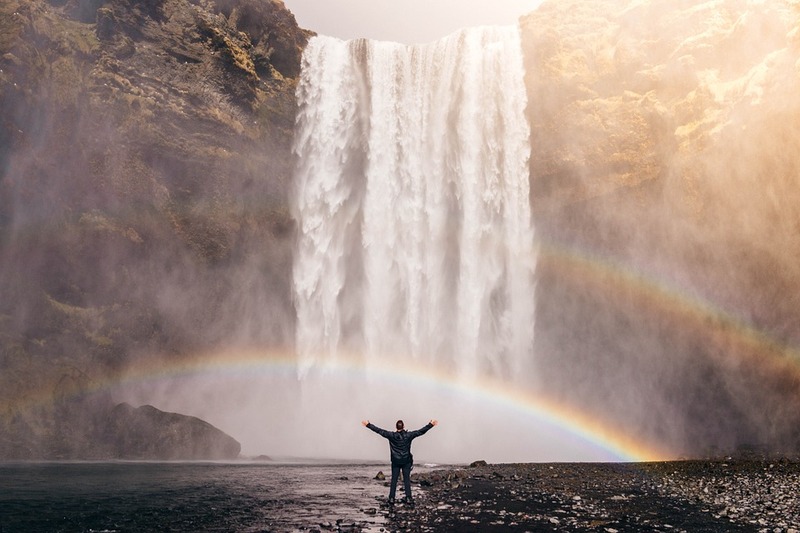 Once you’ve picked the waterfall you want to visit search for an affordable getaway in the holiday comparison search engine. Then you can plan with these useful tips.